After calling Amsterdam home for two years, and having visited here all my life, I finally know my way around for cool home decor shops in this pretty city. Are you visiting Amsterdam soon? And are you curious where to shop some awesome home and interior stuff? Here are 12 of the best to my opinion. I tried to put together a list with different kinds of home decor shops, let me know if I missed any! You’ll have to catch them bang in time, because they’re doors are open two weekends a month, but the treasures you can find here are worth it. Perfect vintage items to decorate your space with, from industrial items to Hollywood regency glam. The store has a botanical vibe, an oasis in a more newly built part of Amsterdam. The whole area is interesting for architecture lovers to have a stroll and take pictures of red buildings, railway bridges, houseboats and the interesting building on Funenpark. It’s close to Indische Buurt and the Dappermarkt area if you have more time to fill and are in search for cosy pubs and coffee houses. Me being a frequent user of Instagram, I became aware of this store online. Being in the impression it was an online-only retailer, I was confused when I walked past their store in Amsterdam-Oost one day. What is Hip offers some higher end home decor and furniture labels with their own unique style. The collection is super colourful, which is super on trend for 2019. Sofas and tables but also candle holders and vases are stuff to find here. In the direct area of de Admiraal de Ruijterweg you can shop at local stores (also on the De Clercqstraat). In Oost, on the Pretoriusstraat you find everything from vegan lunch spots to more authentic Turkish restaurants. This is one of those shops where you enter with no intention of buying anything, and then leaving with a shopping bag filled with stuff you don’t particularly need. Funky accessories and lifestyle items a plenty at & Klevering. They have location in the city centre, in the south and in the east of Amsterdam, so there is always a store nearby if you have 45 minutes spare to do some damage. The store front -to my opinion- implies that the store is super expensive, but to my opinion this is not that bad. When you visit the Haarlemmerstraat store, you can walk from central station through the Haarlemmerdijk to the Haarlemmerdijk, which is filled with little shops for vinyl, vintage clothing, coffee houses and other cozy spots. 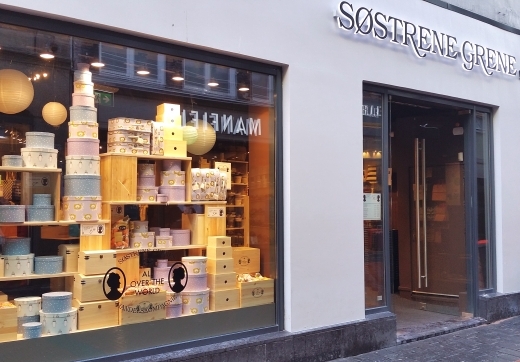 Located in the main shopping district of our city, Søstrene Grene is a shop you just should stop by. It is a chain of shops, which you can also find in other Dutch cities. The items are really fairly priced, are designed in a true Scandinavian manner and are always super handy. The collection refreshes regularly here, so stopping by once every few weeks is no overkill at all. I recommend the candles they sell a piece in cool colours. They also have a lot of stuff for in the kitchen, which is always a good thing. The Nieuwendijk -and the Kalverstraat which this street flows into- are perfect for shopping. Big chain stores are all here, so whatever you search for, you can find it here. Fest Amsterdam is a design firm born and grown in Amsterdam. They have a beautiful minimalistic yet frivol approach to design of sofas, chairs and tables. Their pillows and vases are also really cool, with geometric shapes and shades of pastels. This is a must visit if you are all about interior design. In the Van Woustraat you find another store on this list, and the area is ideal for discovering the slighly less touristy part of Amsterdam south of the canals. Around the corner is the Sarphatipark for some peace and quiet, as well as one of my favourite pubs: Cafe Sarphaat. The east of Amsterdam used to be rundown and somewhere you wouldn’t want to be found dead. Nowadays however, this district of Amsterdam is super trendy. Which shows in the shops you can find there. 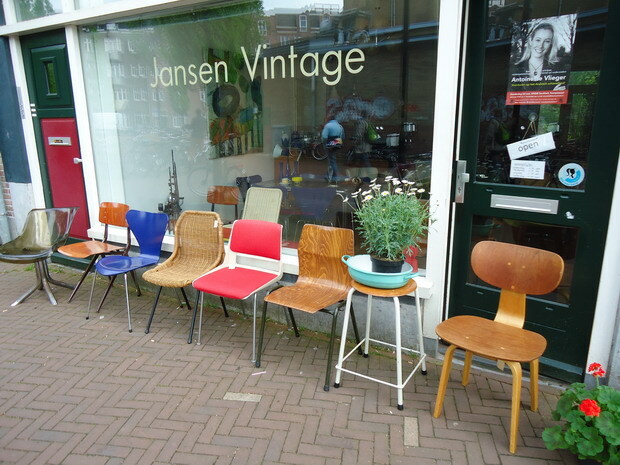 Jansen Vintage is one of those authentic corner shops where you can find vintage furniture and home decor items for a reasonably fair price. They mostly offer stuff from the fifties, so if you’re looking for formica, chrome lamps and teak chairs: this is the place for you. 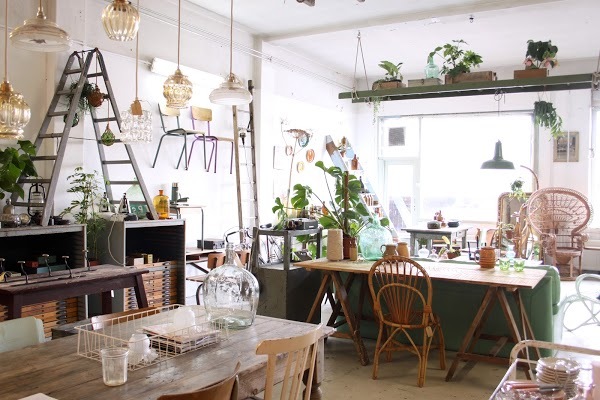 In the area around this shop, the Indische Buurt, you can just stroll around and go for drinks at Het Badhuis (Javaplein 21) or go for coffee and pastries at Hartje Oost (Javastraat 23). On hot days you can chill in the Flevopark which is located next to this neighbourhood. If you’re just here to walk along the many canals we have to offer in Amsterdam, you might want to swing by Arket on Koningsplein. 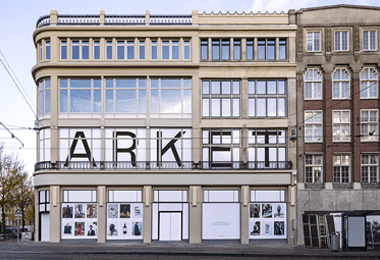 Arket is a chain of stores, but the only one in The Netherlands is this one in Amsterdam. They offer clothes and home decor items, focused on high quality basics to fit in with every style. Think H&M Home but more minimalistic and with a stronger focus on design. The clothing they have is also focused on quality. I have a few items from there, and I can say I absolutely recommend. In the area you can stare at all the unique canal houses in the area, or shop at any of the other flagship kind of stores in the direct area. Leidseplein and Spui are also close, so there is no reason to be bored. 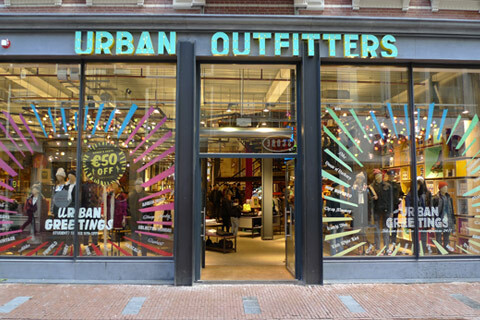 Urban Outfitters is a chain of stores which mostly focuses on clothing, but also offers interior and home decor items. Basically, if you’re a Millennial, chances are you like the stuff Urban Outfitters offers. This one is located bang in the middle of Amsterdam’s main shopping district, which makes it easy to swing by for a quick look around. They sell fun planters, vintage inspired items, vinyl records, cups and mugs, bedding and bath mats. hCool pastels and neon colours are well represented. Once you’re here for home decor, you must also look around in their massive collection of clothing. Pro tip: look in their Urban Renewal section. This is where they sell nice vintage clothes, sometimes remade in even better pieces. 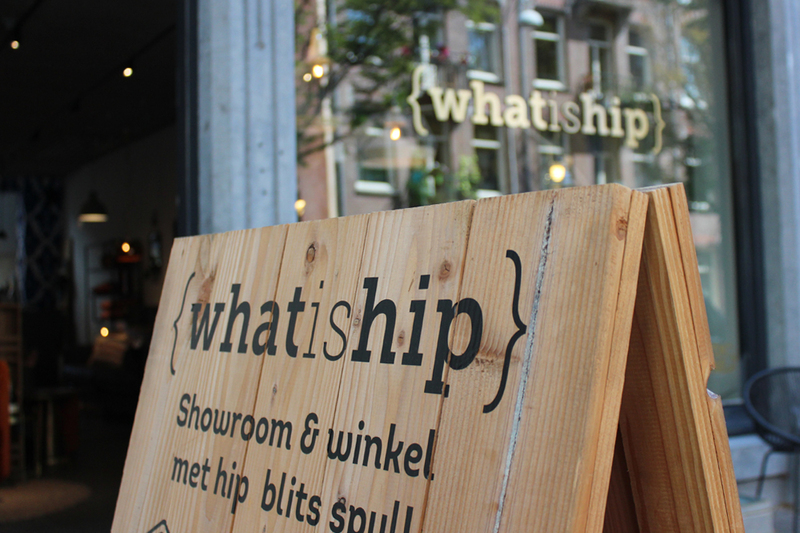 Hutspot is one of Amsterdam’s go to conceptstores for clothing and home decor. They have a nice collection of lesser known designers in their stores and the staff have close relations to the designers they have in their shop. I’ve been to the one on Rozengracht several times because that was close to my old home, but from what I’ve heard, the one on Van Woustraat is just as enjoyable. The location on Rozengracht is bang in the middle of the Jordaan area, with their cozy village like streets and lots and lots of traditional Amsterdam pubs. The one on Van Woustraat is in the trendy De Pijp area, where you can enjoy yourself into the early hours of the morning. Also around the corner is the famous Albert Cuypmarkt, so lots of activities once you’re done shoppin’ here. 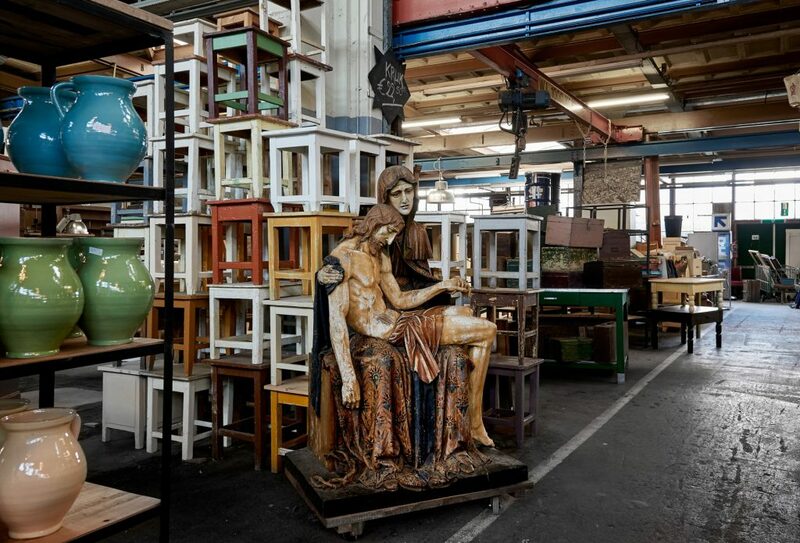 Van Dijk en Ko is one of those stores which you might not want to enter due to it looking cluttered, but hidden behind that facade is a bombastic collection of treasures. This place is perfect if you love vintage, but don’t have the patience to search for hours on end in thrift stores. It is a bit outside of the city centre, but the area is worth the travel. Taking the ferry from central station to either NDSM or Buiksloterweg it is a nice bike ride through a more industrial and gritty side of Amsterdam most tourists will never see. Once you’re there, be sure to also visit Neef Louis Design next door and Kringloop De Lokatie (Distelweg 85). At IJ-hallen (T.T. Neveritaweg 15), which is located nearby, there are monthly flea markets which I can recommend. All being said, a perfect days outing if you’re getting tired of our historic canals. Say, you’d like to get some inspiration from awesome design pieces? And say: these design pieces are all super minimalistic with interesting colour ways? Then HAY Amsterdam is your go to spot. This is also one of Amsterdam’s staples when talking about designers. 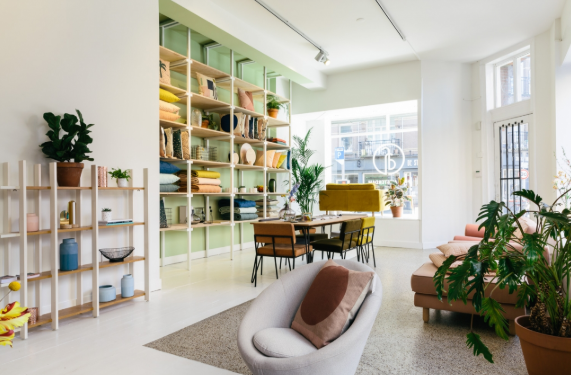 The HAY flagship store / showroom is located in the middle of middle of Amsterdam’s city centre, with lots of shops, pubs, coffee shops and the Singel super closeby. A few other hotspots on this list are also just around the corner, so you shouldn’t be bored here. Us humans need chairs. Preferably pretty vintage ones. 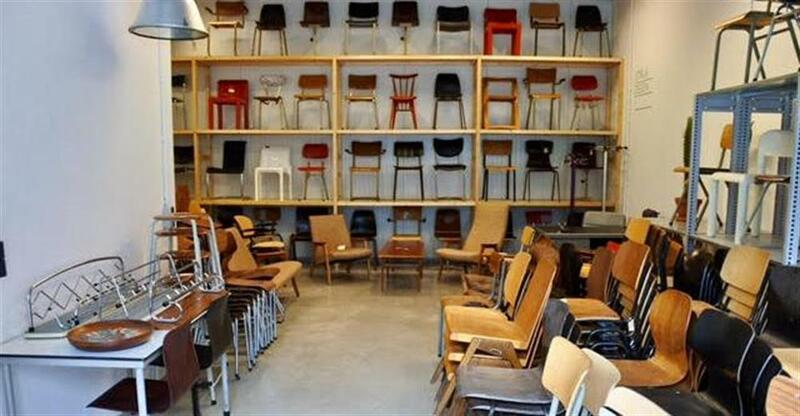 If you need new chairs, then you must stop by Strijk Design if you’re in the area on a Saturday. They have lots and lots of design items from the fifties and sixties, and more industrial items from more recent times. 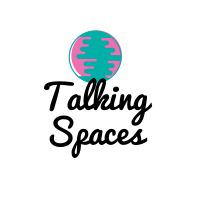 I became aware of this business through Marktplaats, because they offer their stuff on there too. As said before, the Amsterdam-Noord area is a bit out of the centre, but I can recommend it strongly. A few of the other hotspots on this list are nearby, and with the NDSM wharf area just around the corner, there is enough to do to keep yourself busy for a day. Look, I’m no expert at this whatsoever. Besides that, you obviously always gravitate to your own style when picking stores to recommend. Do you have any others you’d strongly recommend? Let me (and the other readers!) know in the comments! In the meantime, keep up with my shenanigans on Instagram. See you around for the next blogpost!